Nearly 300 couples attended the 2017 Operation Heal Our Patriots Reunion. Nearly 300 couples gathered in West Virginia to strengthen their marriages and rekindle important friendships. Michael and Rebecca Bennett were among 12 couples who rededicated their marriages during the reunion in West Virginia. On Saturday afternoon, March 25, Michael and Rebecca Bennett walked out of a small West Virginia chapel clearly moved by the commitment they had just made to God and to each other. And though Saturday’s simple rededication ceremony in front of a small group of friends was free of the pomp and grandeur of their large wedding 13 years ago, it carried significant weight. The Bennetts—who both served in the Air Force—were one of 12 military couples to rededicate their marriages to God and each other as part of the Operation Heal Our Patriots Reunion March 24-26, 2017. Nearly 300 couples—each with at least one spouse injured in combat or combat-related activity since 9/11—attended the weekend of marriage enrichment where they heard from an inspiring lineup of speakers and got a chance to reunite with friends. Most important, the couples were reminded of God’s power to heal them and their marriages. Franklin Graham presented the Gospel to military couples at the reunion on Friday night. Samaritan’s Purse President Franklin Graham launched the event reminding participants that marriage retreats and programs don’t save people or their marriages—only God can do that. “I want you to know that God knows everything about you,” he said. “And God loves you. Texas State Senator Brian Birdwell, a veteran and survivor of the 9/11 terror attack on the Pentagon, gave his testimony to God’s comfort in terrible circumstances. 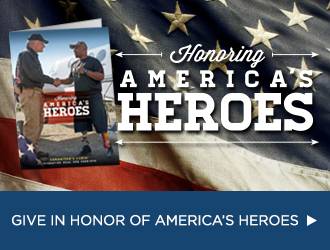 Since its beginning in 2012, nearly 700 couples have become part of the Operation Heal Our Patriots family, the Samaritan’s Purse project that shares God’s healing love with injured service personnel and their spouses. Alongside ongoing aftercare ministry, the annual Reunion provides veteran couples a unique opportunity to strengthen their marriages, their relationship with Christ, and their friendships with other military families. Participants this year learned from practical workshops on how to set healthy boundaries, deal with post-traumatic stress, handle blended family dynamics, and find a post-injury, post-military identity in Christ. Music and worship were led by the Tommy Coomes Band and Dennis Agajanian. Couples also were inspired by retired military leaders, including Army Lieutenant Colonel Brian Birdwell, whose harrowing personal testimony regarding the 9/11 Pentagon attack and the severe burns he suffered over 60 percent of his body deeply affected the audience. He repeatedly pointed to Christ as His comfort and strength in an unspeakably difficult situation. Greta Van Susteren (left), Michael Smalley, and Amy Smalley spoke to veteran couples over the weekend. Missing limbs, prosthetics, canes, walkers, and about two dozen service dogs visibly bore witness to the price that patriot couples have paid. Invisible but just as dramatic conditions such as post-traumatic stress disorder and traumatic brain injury have also taken a very heavy toll on lives and marriages. “Do you feel like God has your back? Because He does,” added Amy. Army Corporal Josh and Amber McCart greet Chaplain Jim Fisher on arrival at the Greenbrier. Michael and Rebecca Bennett chose this weekend and the Reunion setting to recommit their marriage to God, in part, because they view the other military couples as family. 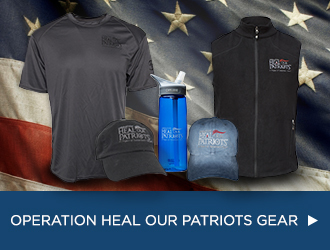 In speaking to couples, longtime friend of Samaritan’s Purse Greta Van Susteren said that what stands out most to her about Operation Heal Our Patriots is the family and community being built for veterans and their spouses. Pat Fleming, Aftercare Manager and Chaplain, spoke on Sunday morning. Each summer Operation Heal Our Patriots welcomes up to 160 new military couples—10 per week—to Samaritan Lodge Alaska for a weeklong marriage enrichment experience. Following that memorable week, these couples are invited to our annual Reunion and our Aftercare events throughout the country, they are provided 24/7 access to Aftercare chaplains, and they are connected with other military couples (and local churches) as part of a growing community of help, hope, and compassionate friendships. The 2017 summer season will mark the project’s sixth year of ministry. “What this organization does, it keeps people married,” said Marine Staff Sergeant Jeff Silva who attended the reunion with his wife Gladys. As the Reunion drew to a close, Aftercare Manager and Chaplain Patrick Fleming led devotions on Sunday morning.